“BIRD HOUSES” is an original watercolor painting by Kevin Slater, resident of the Hoosier State, Indiana. Kevin is a quadriplegic from a high school wrestling accident in 1973. He paints with specially adapted brushes held in his mouth. This greeting card was reproduced from an original artwork by Kevin Slater for THASC Sales Co. which has employed a unique group of handicapped artists who create art to help rehabilitate themselves. They gain self-respect and pride through their artwork. It is so easy to love this greeting card, isn’t it? The beautiful colors and the topic remind us that Spring is close by and that soon our feathered friends will be our neighbors. I always wondered how they fit through those little holes and made their homes or nests in such a small place and wonder how did they ever survive winter without such protection? Now I know why. 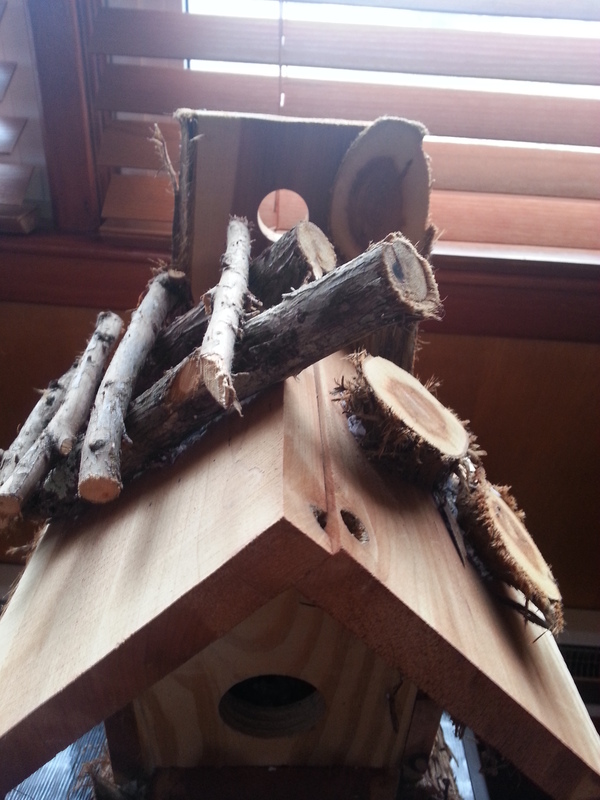 I will admit that I tried my first bird house last autumn and didn’t have much luck. However, things are about to change. 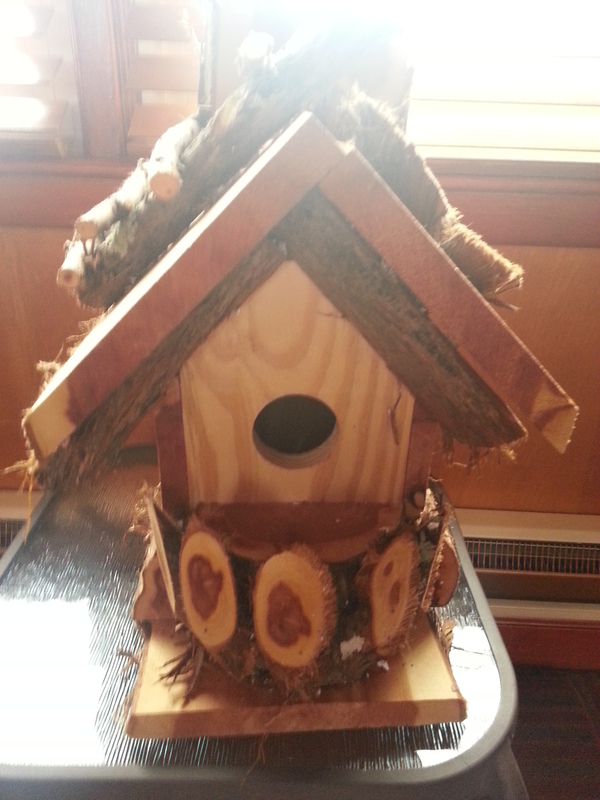 This past Christmas, my cousin Michael sent me the most spectacular hand-made birdhouse I have ever seen. In fact, I think there are just three people that have one like this made purely of cypress, one of few woods that are good for birdhouses. It is large, decorative and resistant and will camouflage well in the garden. Bird houses are supposed to blend in with the surroundings to prevent attracting predators from destroying them. 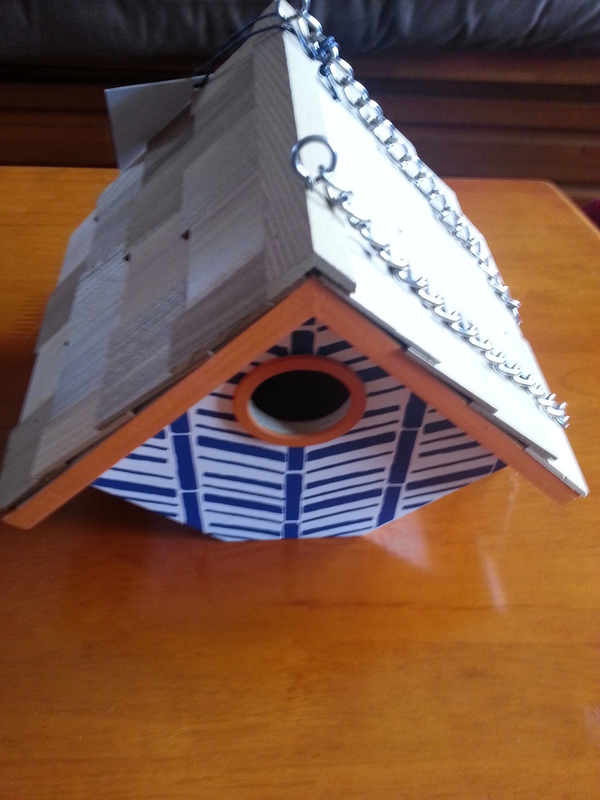 One of my girlfriends named Gini gifted me with another lovely birdhouse for my birthday. This one is hand-painted and beautifully designed with a nice, heavy chain. I think as soon as I do my Spring clean up in the back yard and the garden is full of flowers, I will put both of them outside. Not all backyard birds use houses including cardinals and orioles, but enough common birds do. About 30 bird species in each region of the country, or cavity-nesters, will also use a birdhouse. The most common occupants are house sparrows, bluebirds, chickadees, purple martins and tree swallows. There are 5 key factors that will give you the best chance to attract nesting birds. Use a birdhouse that fits: Small birds need small houses, and large birds need large houses. Pick the proper house design : Wood is the best material. The houses should also have ventilation around the top and drainage holes in the floor. Select a suitable nesting location: The best location for bluebirds is an area surrounded by fields where the insects they eat are plentiful for them and their young. Tree swallows want to be closer to water where aquatic insects are bountiful. Hang it at the right height: Bluebirds like them about 5-8 feet above the ground whereas house wrens prefer them 6- 10 feet above the ground and hanging from a tree. 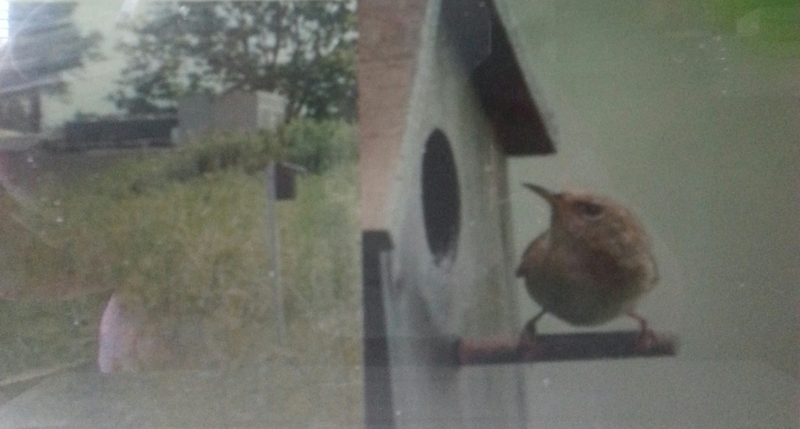 Check the entrance hole: House wrens require the smallest entrance only 1-1/8 inches; bluebirds need about 1-½ inches to get inside. THASC’s artist, Kevin Slater, reminds us of why it is important to have birdhouses, also known as nest boxes, because they are a safe-haven for birds to raise their young. They protect birds in winter that huddle together for warmth. In migration they serve as a safe place to rest. Lastly, birds eat seeds and spread them, which in turn promotes plant growth, and they also eat annoying insects. I just went outside and saw the first shoots of my Spring flowers pushing through the earth. I heard the tweets of birds in the distance. They will be coming closer and I am so happy I can offer them a home. Why don’t you try it too! I like to wake up to the birds singing, spring is the best time for that. Kevin SLaters, work is amazing. Love how he can paint with his mouth,now thats talent! 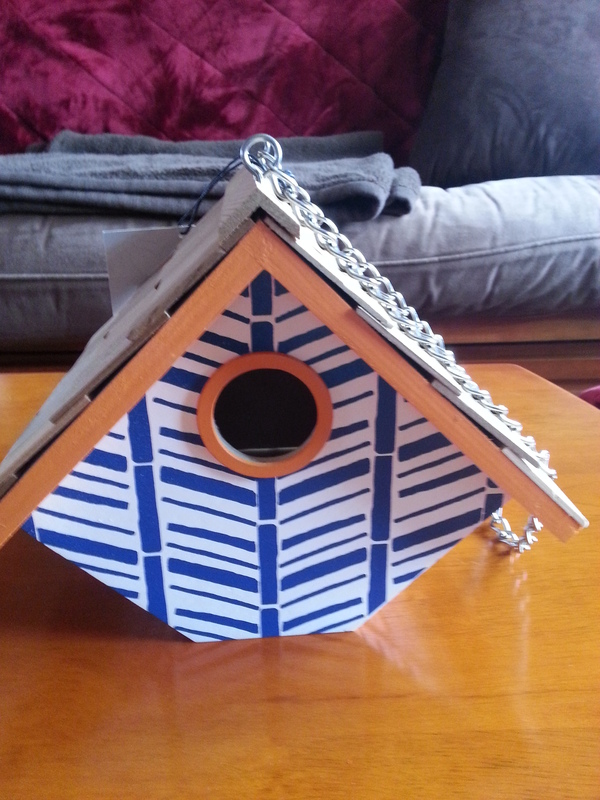 I made a few bird houses with my son, they are fun to make. I love when birds make a nests in the trees, its fun to see the mother protecting her eggs. Well, your paintings are very good,keep up the good work. And have,fun bird watching!! !